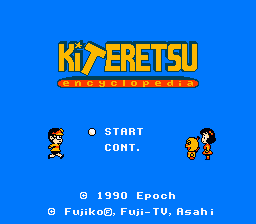 Kiteretsu Daihyakka is an action platformer game for the Nintendo Entertainment System. The game is based on a Japanese comics that also got an animated series. 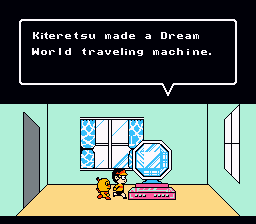 Kiteretsu made a Dream World traveling machine, the Dream Mirror. But it went haywire and scattered Kiteretsu and his friends in Dream World. Its up to Kiteretsu to save them and go back home. The game features standard platforming with an additional feature where the player can walk and jump upside down. 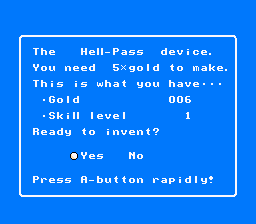 The player also needs to find blueprints used to create new inventions to progress through the game. 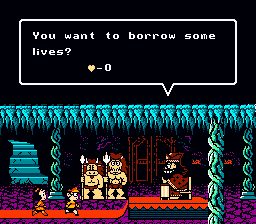 This is an English translation of “Kiteretsu Daihyakka” for the NES. The game is based on an anime of the same title.